Is the VIX Warning of Coming Equity Weakness? 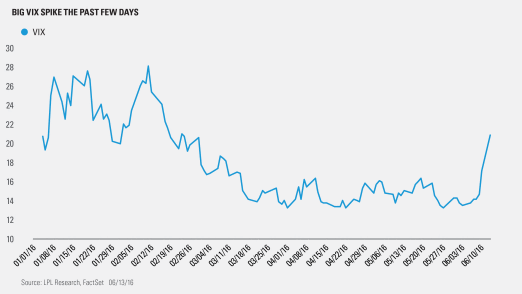 Some very peculiar action has taken place recently on the CBOE Volatility Index (VIX) with a huge spike in the past three days, amid a relatively modest equity sell-off, and gaining for six straight days for the first time since last August. First things first, the VIX is commonly known in investing circles as the “fear gauge” or “fear index.” Spikes in the VIX are consistent with an increase in hedging against downside volatility, or plainly stated, hedging against potential market drops. So, is the recent spike a warning sign? Just yesterday, the VIX soared 22% from 17 to nearly 21, yet the S&P 500 lost only 0.8%. There have been 70 total times since 1990 that the VIX jumped 20% in one day, and the average S&P 500 drop on those days has been 3.0%. In fact, only three times in history has the S&P 500 not lost at least 1%, including yesterday. Taking it out a little further, over the past three days the VIX spiked 48%, while the S&P 500 lost 1.9%. Incredibly, this is the smallest loss for the S&P 500 out of 18 previous times the VIX jumped more than 48% in three days. To see this type of spike in the VIX when the S&P 500 doesn’t drop significantly is extremely rare. Why could this be happening now? It could be as simple as uncertainty in the markets due to two upcoming events: the Federal Reserve’s (Fed) decision on interest rates releases tomorrow, while the Brexit decision is next week. In other words, we could be seeing this spike due to investors’ anticipation of these events, with many potentially hedging against any downside risk. What could this spike mean for future market performance? 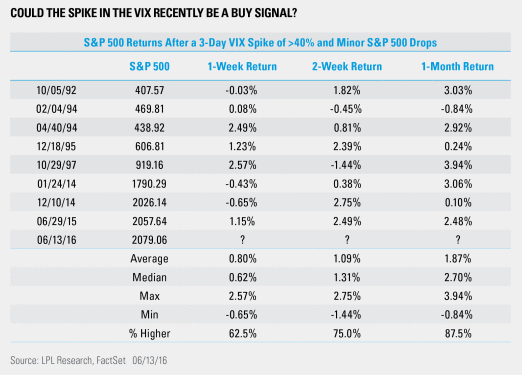 We looked and found there were eight other times the VIX spiked more than 40% within three days, while the S&P 500 fell less than 3% over those same three days. In other words, big jumps in the VIX, yet a relatively modest drop in equities. The near-term results after this occurs are quite strong, as the S&P 500 is up nearly +2% on average a month later with a median return of +2.7%. The one-week and two-week returns are quite strong as well. 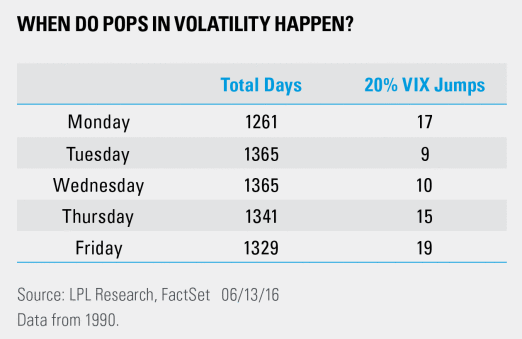 Lastly, when do big pops in the VIX tend to happen? We all know some of the most famous market drops ever took place on Mondays, and sure enough, Monday has seen 17 VIX jumps of 20%. Still though, this isn’t as many as Friday and its 19 VIX spikes of 20%. The least likely times for a big VIX spike are Tuesday and Wednesday. Once again, investors are bracing for the worst. Although we would agree that some type of downside action in the summer months could be likely, this study would suggest the odds of a large sell-off of more than 10% starting now may be low.